O'odham in Mexico cut the fence on the border today, Friday, March 4, 2016, which restricted O'odham's traditional route. The fence at The San Miguel Gate, south of Sells, Arizona, went up at 10 a.m. yesterday. This fence restricted O'odham access to health care and stores on the northern side of O'odham lands, on the Tohono O'odham Nation. O'odham Land -- O'odham in Mexico Governor of Wo'osan Raymond Valenzuela took action today to open the access road into the northern lands by removing the fence, fence poles and signs, that went up on Thursday, March 3, 2016. Mexican ranchers have long encroached on O'odham lands and made illegal claims to O'odham lands. These Mexican ranchers have squatted on O'odham lands. Yesterday they closed access to the O'odham traditional route. O'odham in Mexico cut the fence on the border, Friday, March 4, 2016, which restricted O'odham's traditional route. The fence at The San Miguel Gate, south of Sells, Arizona, went up at 10 a.m. yesterday. This fence restricted O'odham access to health care and stores on the northern side of O'odham lands, on the Tohono O'odham Nation. 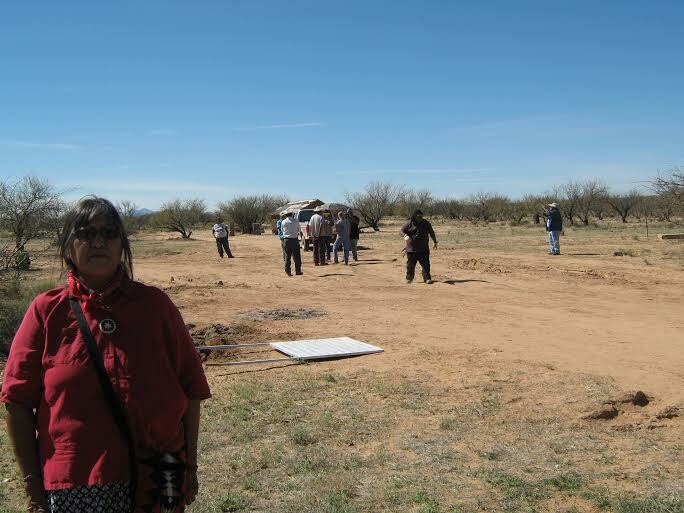 Un paso firme en mantener viva la memoria y los derechos internacionalmente reconocidos de la nación tohono o'odham, desde mediados del siglo XIX. Y firmados también por el acuerdo 169 de la OIT.